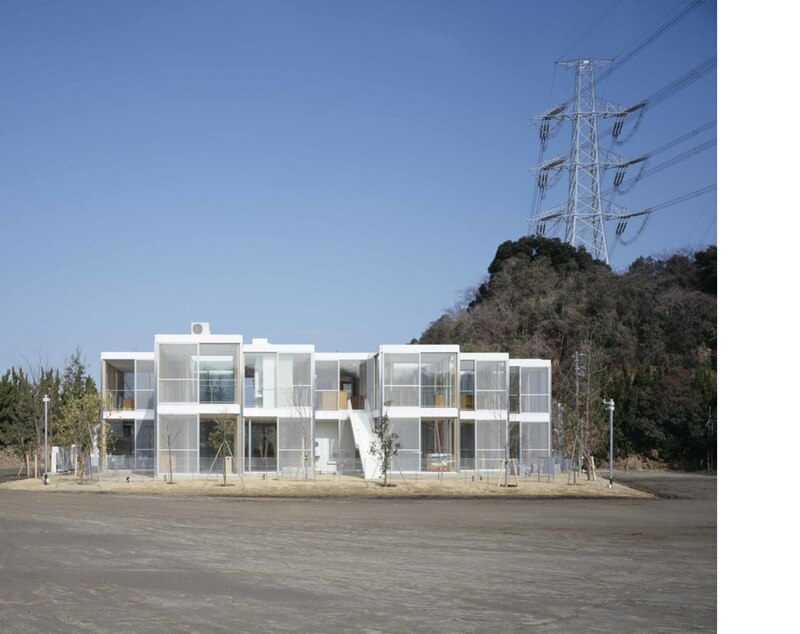 A glass building such as Takeshi Hosaka’s Hongodai Christ Church School in Yokohama achieves a degree of coexistence between the natural and artificial worlds that is itself a contradiction. 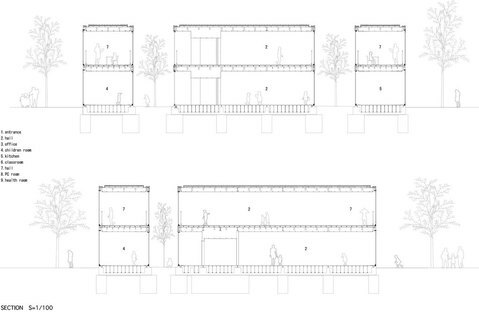 Takeshi Hosaka’s Hongodai Christ Church School uses architecture to propose a new way of learning. 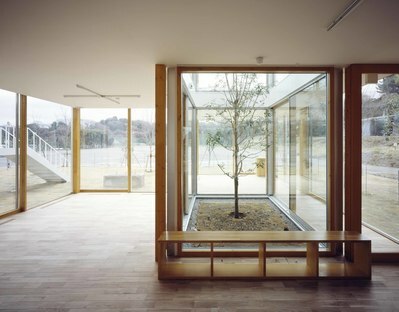 Hongodai Christ Church religious school and nursery in Yokohama is an experiment by Takeshi Hosaka to determine whether it is possible to live a protected life surrounded by nature. 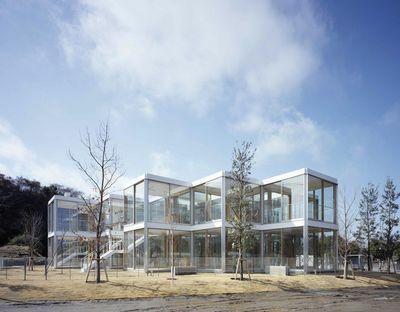 In the design of Hongodai Christ Church School in Yokohama, Takeshi Hosaka challenges rules of living that have been handed down over centuries, such as the distance between the natural and artificial worlds. Architecture has always aimed to protect man from the elements, from the natural aggression of the climate, but as a result has deprived us of direct contact with nature, which also has great benefits to offer. 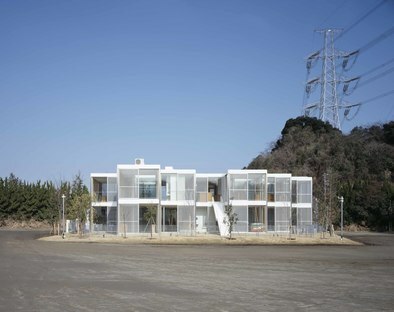 Takeshi Hosaka’s projects have habituated us to a concept of architecture as contemplation of nature. 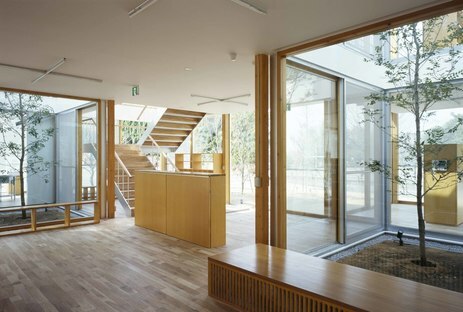 In Hongodai Christ Church School, the Japanese architect accepts nature as a tangible, present part of living through structural and climatic choices guaranteeing the well-being of the building’s users. The nature he has chosen is not an urban landscape, but the hills of a part of Yokohama characterised by meadows and fields. 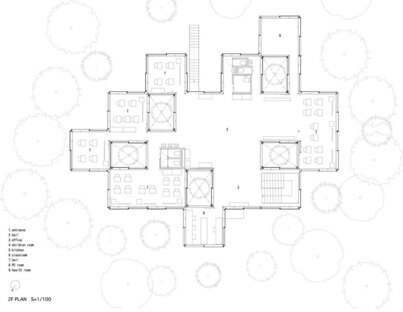 The building’s layout winds around the small lot housing the religious school and nursery, following the perimeter of the trees; its irregularity is a result of spontaneous natural growth which does not follow a geometric grid but grows randomly like a forest. 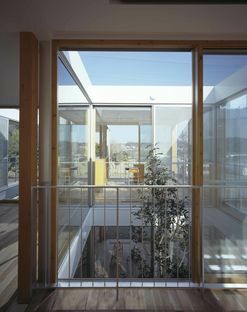 The primary intent of this two-floor all-glass building based on a thin timber frame is to occupy the empty spaces left by nature and put together a new landscape in which the human habitat blends with that of the plants, obtaining maximum visual benefit and comfort. 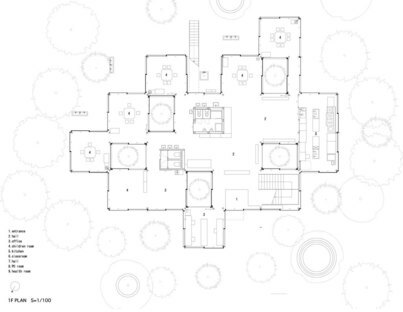 The project is not a matter of simply combining architecture with landscape, but of weaving them together: the trees are not simply avoided or approached by the building's perimeter, but incorporated in it to create open courtyards. 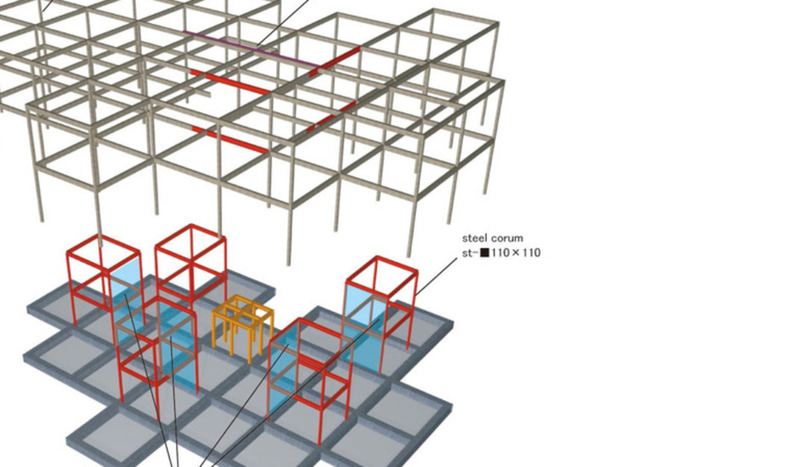 Having designed the structural grid on two levels, the modules of which each refer to a specific activity, all the vertical surfaces are closed in with glass to create a school in a glass house. 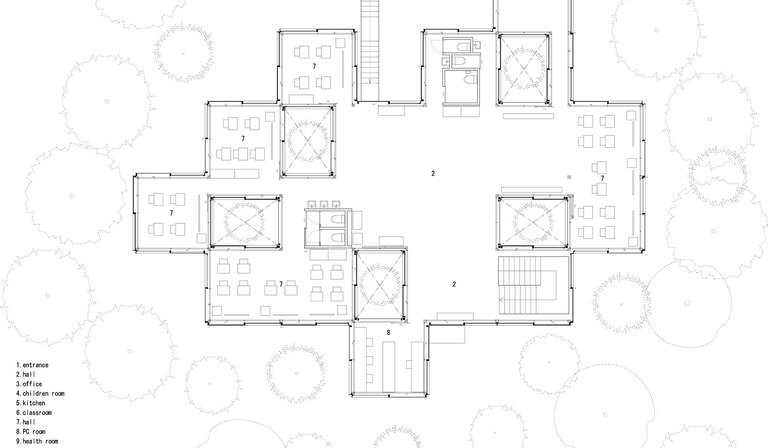 As there are no brick walls, all the furnishings are all-round, and all the activities that take place in the room make use of all the available space, organised with no constraints on the use of space. 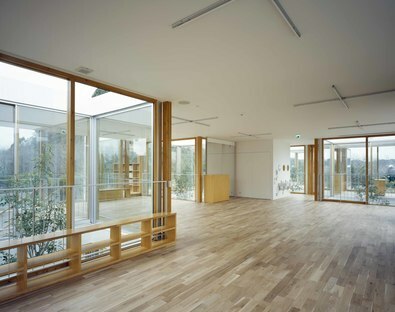 The choice of making all the walls out of glass and using sliding internal subdivisions not only achieves the goal of dialogue between inside and outside, between the building and nature, but among different interiors, permitting sharing of space and educational activities that are stimulating for children. The glass perimeter continues to define the space, the edges of which are perceptible, but does not establish precise visual confines, so that it is always possible to allow your mind to wander. 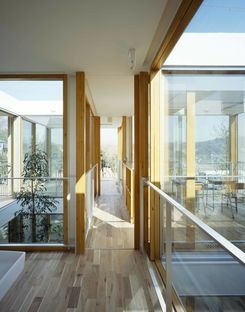 The patio doors can also be opened to create natural ventilation when required. 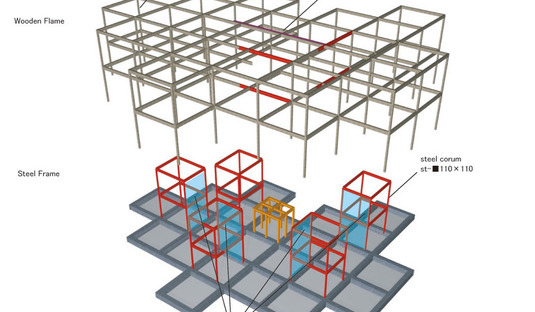 Taking into account the absence of brick walls, an underfloor climate control system has been installed for use in the rigid winter temperatures. 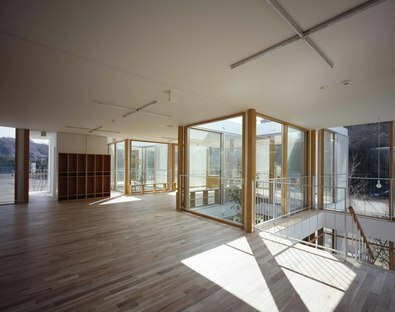 Arup Japan took care of earthquake-proofing, concealing steel moment frames in the wooden structure of the 5 patios and a new shock absorbing system in the glass walls, the “Seismic Glass Wall with Oil Damper”.